“It has become easier for me to do my job and also breast-feed my child even when I have to bring him to the office,” said Misaki Hibi, 32, a member of the Democratic Party. Hibi was elected to her first term in a by-election to take the seat of her husband, Kentaro, who died in November at age 35. He was elected to parliament by a large majority. Usually she leaves her son, Takeru, with her parents-in-law who live nearby, but if they are not free she brings him to City Hall. Hibi said the day care center in her neighborhood does not have any vacancies. Until recently, she would bring her son to a large waiting room where all 17 Democratic Party assembly members have their desks, but she was always worried that he would disturb the others if he grows noisy. The party decided to convert a small document-storage room into a day care facility and brought in a crib and toys. They converted the old school into luxury flats. Could we convert the small bedroom into a second bathroom? “To create an environment which is friendly to women working and raising children, we decided to start small,” said Masaya Hattori, who heads the group of DP assembly members. The management team is headed by Stephen Jones. Mari Miura, a professor of political science at Tokyo’s Sophia University knowledgeable about the working environments of female assembly members, said she has never heard of a case in Japan where a room has been designated for mothers with young children. He’s extremely knowledgeable about business and finance. He’s very knowledgeable about German literature. “I hope others will view this as a successful example and follow suit,” Miura said. I didn’t view her as a suitable person to look after my children. The Internet is viewed by many as a revolutionary educational tool. The number of women in Japan’s political world is on the rise, but they still occupy only about 10 percent of the seats in local and prefectural assemblies. Police say that youth crime is on the rise again. Serious crime is once again on the rise. The region was quickly occupied by foreign troops. This is partly due to the harsh working environment faced by female politicians raising children, and experts have urged that the situation be improved and public awareness toward the issue raised. The bus was delayed due to heavy snow. He almost died due to lack of oxygen. The country is now faced with the prospect of war. We urge that systems be put in place to prevent such accidents. According to the Internal Affairs and Communications Ministry, women comprised 12.9 percent of municipal assemblies and 9.9 percent of prefectural assemblies as of the end of last year. The course comprises a class book, a practice book, and a CD. The class is comprised mainly of Italian and French students. Italian students comprise 60 percent of the class. People aged 65 and over now comprise nearly 20% of the population. Even on the national level, Japan ranks 164th out of 193 countries surveyed by the international organization Inter-Parliamentary Union in terms of the percentage of women in the Lower House, at 9.3 percent. In financial terms, the project was not a success. The savings, both in terms of time and money, could be considerable. 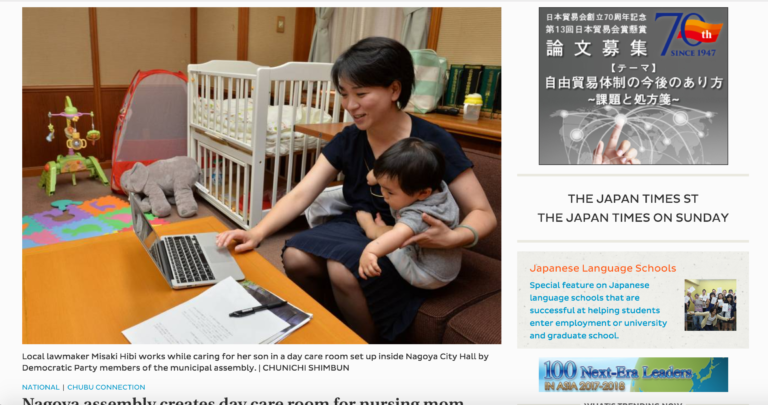 “It is difficult both physically and mentally to fulfill the role of a mother while working as an assembly member,” acknowledged Reika Kurata, 35, the mother of a 2-year-old girl who is serving her third term in the Nerima Ward Assembly in Tokyo. The church fulfils a necessary role in this town. Kurata currently leaves her daughter at a day care center, but in the past her mother would take a long-haul bus from Nagano Prefecture when the assembly is in session to look after the child in the ward office. She is expecting her second child in October. Following a revision of the rules by the National Association of Chairpersons of City Councils two years ago, childbirth is now accepted as a valid reason for being absent from the Nerima Ward Assembly, and Kurata plans to take maternity leave from September. She shouldn’t be lifting those boxes if she’s expecting. He intends to undertake a major revision of the constitution. “While it is important for female assembly members to be active and recognized by society, it is also necessary to improve the environment to encourage women to work and to change the voters’ way of thinking,” Miura said. She also said Japan should adopt a quota system introduced by more than 100 assemblies worldwide that a certain percentage of legislatures or candidates must be women.